GitHub - pokemongo-dev-contrib/pokemongo-json-pokedex: Transform the data from the Pokemon GO master files to a better readable & processable JSON file. Transform the data from the Pokemon GO master files to a better readable & processable JSON file. Want to be notified of new releases in pokemongo-dev-contrib/pokemongo-json-pokedex? This program transforms the data from the Pokemon GO master files to a better readable & processable JSON file. As a developer it can be in certain situation quite annoying depend on the raw GAME MASTER files. Not only are some informations quite hidden and must be parsed, the structure of the GAME MASTER files can change after every version. 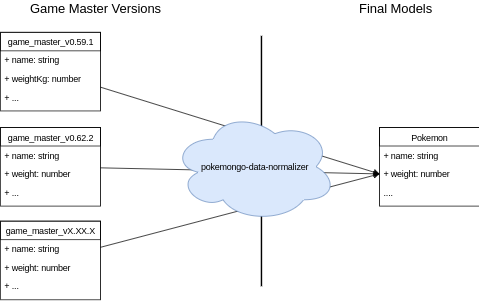 pokemongo-json-pokedex parses the GAME MASTER data and tries to maintain the same structure, even when the structure of the source files changed completely. You can install it with npm install pokemongo-json-pokedex. Make sure you have a least Node 8.x.x running on your machine. Get the latest data with Docker into the output folder in your current directory. You can get the latest version by executing the following command in your shell.